Your wading staff needs to be firmly attached to your vest or belt for those times you need to chase your fish. The following is a collection of tips that come from many trips, many days, and many hours steelheading on B.C. rivers. They are valuable to all steelheaders whether they fish with gear, bait or fly fish. I have been fortunate to have fished many of B.C. 's prime steelheading waters over the past four decades. From my home on Vancouver Island I have easy access to a wide selection of watersheds all having both summer and winter steelhead runs. I firmly believe that we live at a time when, while it often appears there are less fish because of the increased numbers of steelheaders, there are in fact greater numbers of fish available for the adventurous angler. Strong runs of wild steelhead and the introduction of hatchery steelhead in many rivers have ensured that steelheading will continue well into the next millennium. In my article " Steelhead Angling Truisms ", I focused on those tips which are certain the greater percentage of the time. With the following tips I add to those truisms and provide personal experiences which should help you hook and release that supreme trophy anadromous rainbow trout , Mykiss. If the unnatural occurs - STRIKE! Many times I have felt a subtle change in my drift, often ever so slight, and on those occasions I have struck and found myself fast to a powerful steelhead. It has happened so often that I now instinctively set the hook whenever my drift becomes unnatural. Yes, I have also hooked submerged logs and underwater rocks but there have been spine tingling steelhead as well. As a rule I have found that this unnatural action occurs most often at the tailout of a pool. Here, where the water begins to shallow, is a favoured location for steelhead as well as the location where underwater debris accumulates. Steelheaders often greet each other with this question, "How many did you break off today?" This is not a reference to fish but to the number of times they have snapped their lines or leaders on a hidden river bottom snag. Steelheaders recognize that steelhead rest on the bottom and will not be caught unless the angler drifts his lures on the bottom as well. Don't take a chance - drift on the bottom and STRIKE when your tackle acts unnatural! Wade out into the pool to be certain that you have covered the prime holding water. 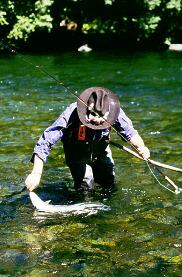 A moving lure or fly will often excite both summer and winter steelhead to strike. This is not what I would call normal behaviour but, it has worked enough times for me that it has become one more repertoire in my creel of tips. If I know steelhead are in a particular pool and I have been unable to hook them fly fishing or float fishing, I will switch to drift fishing methods whereby I reel a fast retrieved lure or fly through the water in the steelhead resting location. A small silver spinner, Spin and Glo lure, or brightly colored streamer fly will often make these seemingly inactive steelhead strike. Be prepared for changeable water conditions. To be consistently successful, steelheaders needs to learn the (their) river environment intimately. They need to understand water hydrology and how it will affect the movement patterns of fish. Remember, only minute sections of river pools, troughs and riffles are steelhead holding locations. I would even go so far as to say that less than 1% of any river will actually hold resting steelhead. These locations will change, some moving up and down in the pool depending upon water eight. Other will disappear because they loose their light, hydrology, and security during differing water heights and colors. Steelheader should master their 'home' river and extend this knowledge to other rivers that they fish. Release steelhead in the pool not on the river rocks - do it with the care and the dignity that this trophy trout deserves. The steelheader must always consider safety during wading. Those steelheaders that have consistent success recognize that to effectively cover good steelhead holding water they must wade. This wading may take the form of short jaunts out into fast moving pools or, actual river crossing in streams to get to the cost effective casting side of a pool. The experienced anglers make certain that they wade with a 'third' leg, a strong wading staff that is tied or attached to their vest. 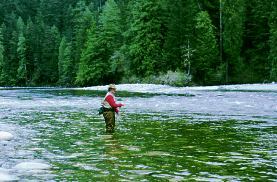 See my article, " Wading the River ", for more detail on this very important steelheading skill. Tackle repair tools: A good Swiss knife or a Leatherman tool are one of those vital items all steelheaders should carry with them when steelheading. I have lost reel nuts and found myself with a broken rod on trips and have blessed these tools for giving me the chance to continue fishing, sometimes miles from my vehicle. In one instance I broke my two-piece rod immediately above the join two hours down a remote west coast river. With the knife I carved a willow branch thin and flat, almost the full length of the rod, then taped it to the dorsal surface of the rod to act as a flexible spine and to keep the two pieces together. I managed to beach two steelhead, one weighing over 18 pounds, with this improvised tool. I have a fondness for three principle knots; the improved clinch knot; the nail knot; and, the blood knot. I have practiced them to the stage that I can now tie them in the dark. Steelheading is often done at dawn, dusk, and during dark overcast days when monofilament can be difficult to see. It is critical that the steelheader is able to tie such intricate and critically important knots during all situations. 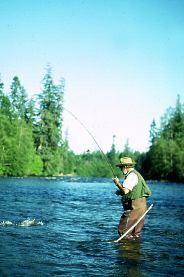 Should you 'nip' a fish or have a 'take' from a steelhead, memorize that exact spot in the river and repeat your cast. If you do not have a second take, rest the water, then, return after 15 minutes or more to fish that same location once again. I am always amazed at how often a steelhead will take a second time from the same location after the pool has been rested. If you can clearly identify a fish that you have released, by some body mark like a scar, you will find that you will often hook the same fish when you return to that pool some hours later. Why this Kamikaze behaviour? Simple - they are rainbow trout! 'Bow to the Fish! ': this is not a frivolous statement but rather a critical skill you should use when you have hooked an active steelhead. When a steelhead decides to leap they will do so with a considerable underwater dash which concludes with the fish leaping high in the air. The pressure on your leader is immense at that skyward moment and can only be eased if you drop your rod tip down parallel to the river, in essence, 'bowing' to the fish. 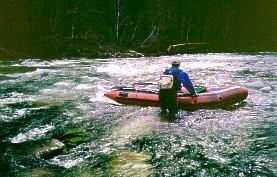 Walk your raft down the river in sections where there is extreme shallow white water. Above all, HUNT, for your steelhead! Steelhead hold in precise locations in every pool. If you do not get a strike in a few casts to these key sites, continue on to the next pool. Do not waste your time on unproductive water. When you do hook a fish memorize the exact lie where the fish took. This location will produce steelhead throughout the season. Once a fish is found the steelheader should handle this special trophy trout with skill, care, and dignity.